American to Britain: Edinburgh and Glasgow. I have always wanted to visit Edinburgh and I seem to go away for my birthday every year so I thought why not. We decided to go to Glasgow also because my sister-in-law lives there. We took the train up from Cambridge, which I highly recommend. It is nice to just sit back, read a book or take a nap, you don't have the aggravation of driving and dealing with traffic.. When you compare the costs in fuel, wear and tear on your car and parking costs, I think that the train is a great option. The train station is in the centre of town and everything is walking distance from there. We stayed at the Regent House Hotel. It was a 10 minute walk from the station and on the north side of town. It was a nice room and had a good breakfast (continental no English breakfast). 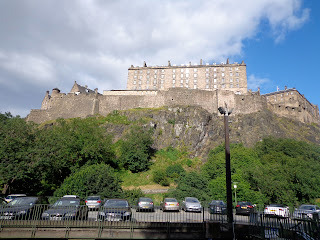 We had to go to Edinburgh Castle as it is one of the main attractions. Mary, Queen of Scots, gave birth to James VI. There is also the Honours of Scotland dating back to the 15th century and were hidden during the Civil War, WWI and WWII. It also hosts the National Museum to the War Museum of Scotland. 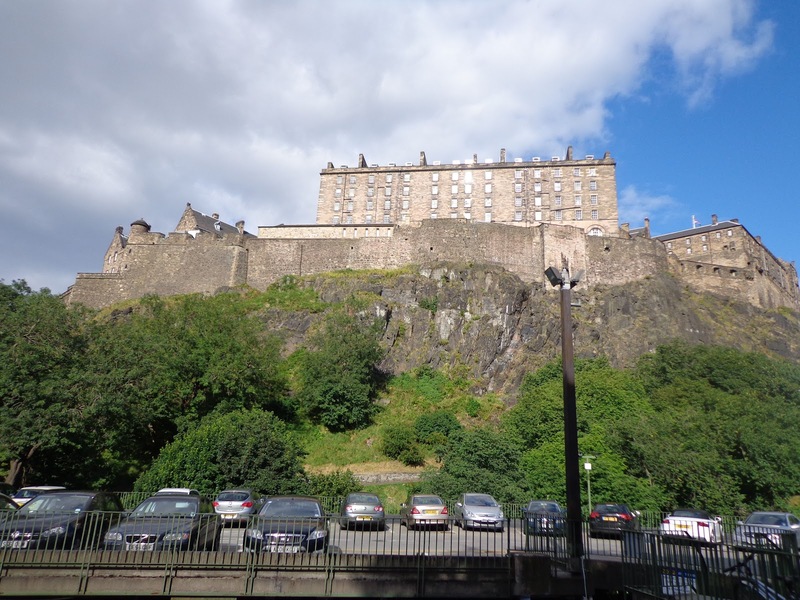 Another interesting thing about Edinburgh Castle is that American POWs in the American Revolution (War of Independence) were held here. You can walk around and see how they lived. There is a gun that fired here every day at one o'clock. The oldest building in Edinburgh is here, stop by St Margaret's Chapel built in the 12th century. 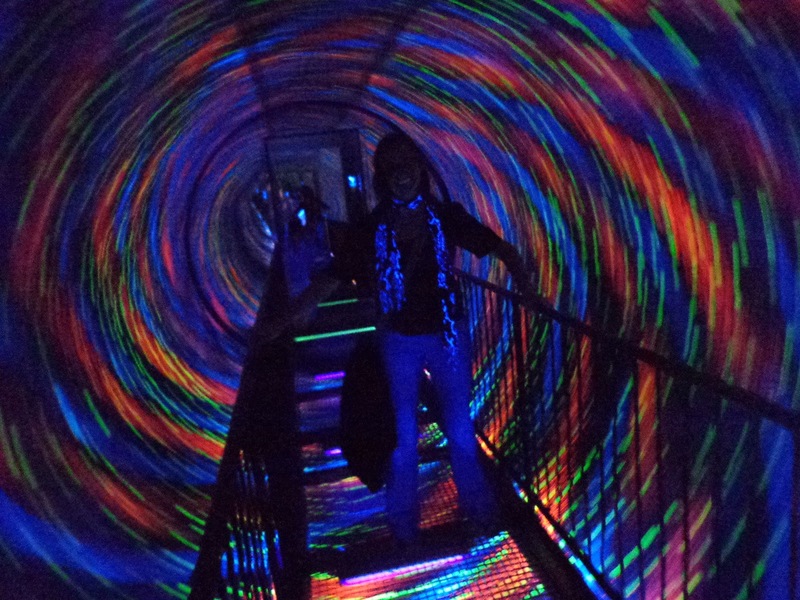 Camera Obscura is right next to Edinburgh Castle and is one of the most popular attractions. It is a great place for adults and children. There are five floors of fun. 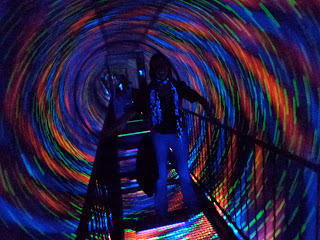 Definitely worth a stop but do see if you can get a coupon for a discount on your entry before you get here. I love to go to royal residences so I had to stop at Holyrood Palace. It was built in 1529 for James V and Mary of Guise. It has a lot of great displays about Mary, Queens of Scots, whose advisor, David Rizzio, was murdered here. You get to see the throne room and other areas of the house where the Queen hosts banquets. My husband really liked the remains of the Holyroodhouse chapel. Across the road from Holyrood Palace, is the the Scottish Parliament. It is free to visit and has a great display about the history of the Scottish Parliament. There are also guided tours. It wasn't until 1997 that the referendum of Scotland was voted and passed and the first Scottish Parliament was voted in 1999. So all of this is relatively new. John Knox started the Scottish Reformation from St Giles Cathedral in the 17th century. The building itself dates back to the 15th century and has an impressive Thistle Chapel with rib-vaulted ceiling. We did the Meerkat Underground tour which we liked but my sister-in-law says that the Auld Reekie Tours are better. But you will be able to find quite a few tour places that will take you under Edinburgh and show you where people used to live. Calton Hill great place to take a stroll and take in the beautiful sights of Edinburgh. This is one of the first parks that was designed for the public as it was deemed important for people to open spaces to walk about. We took a train from Edinburgh to Glasgow. It was about an hour long and loved the service on Scottish Rail. They had trolleys where you could buy food and drink and free wifi! Provand's Lordship is the only medieval building in Glasgow. Its a great place to see how people lived in a 15th century household. 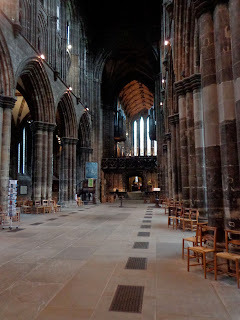 Glasgow Cathedral is a must see! I think that most churches are beautiful and inspiring. 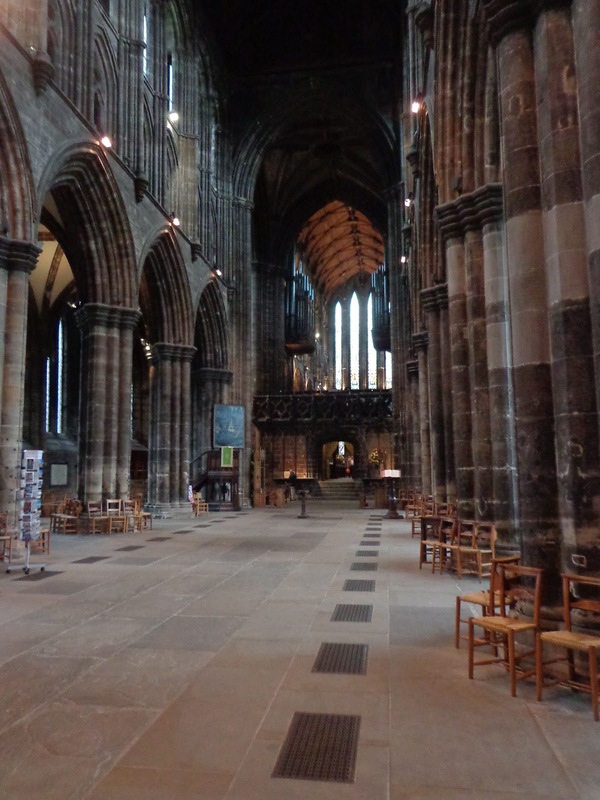 This one is a rare example because it was not destroyed during the Scottish Reformation. It is built on two levels because the sloping hill. The crypt is just as impressive as the main level. Glasgow Necropolis is right behind Glasgow Cathedral. Take a walk up the hill and see amazing views of Glasgow and see the monument to John Knox. It is a Victorian cemetery. 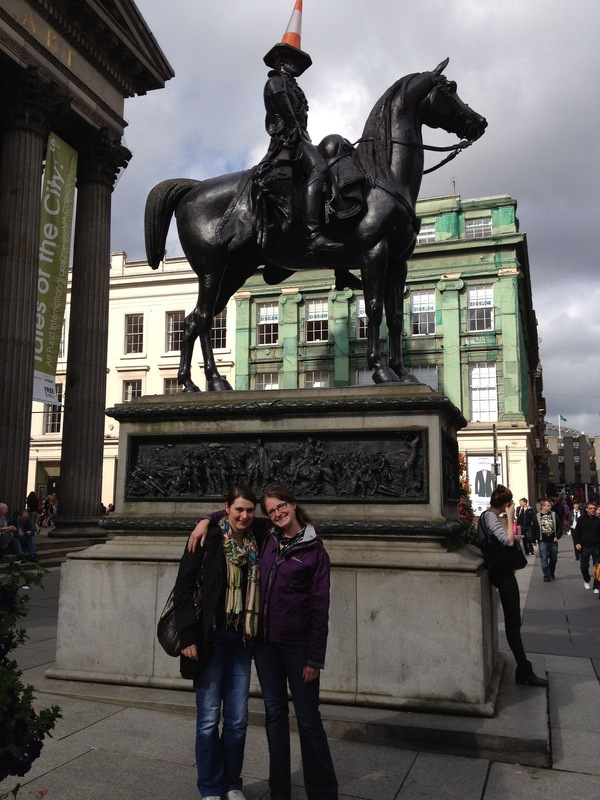 No visit to Glasgow is complete without a picture with the statue with a traffic cone on it. My sister-in-law went to university here and has said that she has never seen it without one on it. If it does get removed, another one is quickly put on top of it. She said she didn't know how because she has a friend try to climb up there without much success!